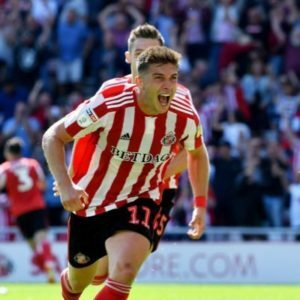 Sunderland got to within one step of a Wembley Final last night, with a victory in the Quarter Finals of the Checkatrade Trophy against a youthful Manchester City side, a win that was in truth, much more comfortable than the scoreline might suggest. With Citeh defending a 9-0 lead in the other EFL cup competition tonight, and Pep Guardiola looking to give some of his fringe players a run out in that, it was unsurprising that few in the ground recognised any of the opposition squad, whose numbers were more appropriate for those playing the grid iron form of football than the one we are more used to. But there were a couple of names which stood out to those in the know. The young lad captaining the visitors was the son of former German international Uwe Rössler and the number 69 Tommy Doyle was the grandson of former Man City captain Mike Doyle and another light blue legend Glyn Pardoe. PS – guess who enlightened me to those facts! Jack Ross had made a whole raft of changes and of course in the days of social media and daily radio phone ins, it didn’t take long for conspiracy theories and uninformed opinions to be aired, but the manager was quick to point out he used all the first choice players who weren’t carrying knocks and it was still a strong starting XI. With Adam Matthews and Bryan Oviedo both fit again, we could revert to having two genuine full backs in their favoured positions. Alim Ozturk got another run out and was one of the stand out players. More on him later. 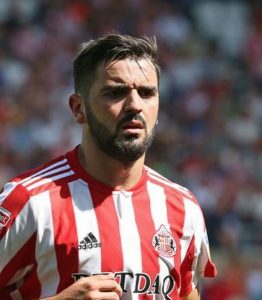 With Dylan McGeouch and Lee Cattermole occupying the holding midfield spots, Luke O’Nien was able to play in a more advanced attacking role and was unlucky not to get on the score sheet. He could easily have had a hat trick. The gangly Benji Kimpioka led the line and grew into the game while Duncan Watmore also started up front. For the first 45, Chris Maguire prowled the gap between the two forward players, with Jack Baldwin and Robbin Ruiter completing the line up. City played the City way. They had plenty of skill and passed the ball about well but rarely threatened Ruiter’s goal. If my memory serves me well he really only had one decent save to make all night when late in the second half he was quickly off his line to smother the ball at the feet of an onrushing City player whose number I didn’t catch. In terms of quality football the visitors were one of the more skillful sides to have visited the Stadium of Light this season. Comfortable on the ball, they worked hard and had a lot of possession, but where it counted they lacked a cutting edge. We seemed content to let them play the ball about at the back and though some around me felt that we should be pressing more and looking to regain the ball higher up the pitch, the fact our players were happy to defend our own half did mean that red and white shirts outnumbered the light blue ones where it mattered and there were few defensive gaps. Ozturk especially revelled in defending this style of play. He was composed, read the game well and made good use of the ball when he had it. He also made one fantastically well timed sliding tackle in the second half and showed why Jack Ross brought him to the club. If only the sides in League 1 adopted a slow methodical build up approach he may have had more game time. The same applied to Dylan McGeouch who ran the midfield, looked composed and won the ball in important areas. He is a cultured player who may actually be more effective at a higher level, where technical skills are more developed. Statistics will show that we had much less of the ball than our opponents but the reality is that we ran the show, which is what you would expect given the difference in experience and development. Watmore was making his runs but in the early stages both he and Kimpioka seemed to try to work the ball into better shooting positions and ended up losing the ball when an earlier attempt might have been better. But it was Watmore who broke the deadlock on 20 minutes when Maguire out wide on the left, played the ball inside to McGeouch. The Scot played the ball into the box where Kimpioka, tried to set himself up for a shot before playing the ball back to McGeouch who had continued his run. He saw a decent shot blocked and was unable to do anything with the rebound which hit him on the chest before he had time to react. Fortunately the ball fell to the unmarked Watmore who hit a low drive across the goal into the bottom left hand corner. Not long after Watmore again made a good run down the right and cutting inside was fouled on the edge of the penalty area. From the resulting free kick Oviedo went for goal and was unlucky to see a lovely curling effort come back off the angle of post and crossbar. So a comfortable 1-0 half time lead and I wasn’t even feeling apprehensive that we might let the game slip. In fact I was expecting us to build on the lead and thinking that my 6-0 prediction might indeed win me a mug! It wasn’t to be but could have been. Catts, had seen yellow early in the first half but wasn’t put off by that and another strong clean challenge saw him win the ball in midfield and play square to O’Nien, who played it forward to Roadrunner. Marked tightly, Watmore played it back to O’Nien whose long range effort whizzed over the bar. There were surely more goals in this team. 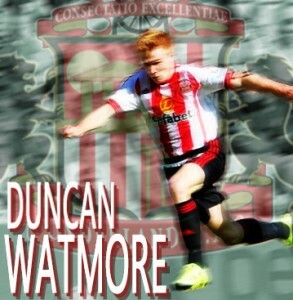 Watmore was starting to tire and on the hour was replaced by Gooch and it didn’t take long for the American to make an impact. 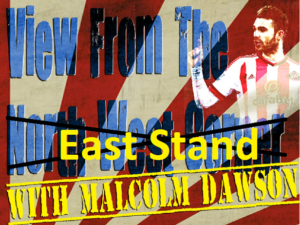 An overlapping Adam Matthews played the ball back to Gooch from near the right hand corner. Gooch took a couple of steps infield before curling a lovely effort into the far corner to double the lead. After that O’Nien and Kimpioka both had multiple chances. One O’Nien shot from the 18 yard line seemed to have squirmed under Grimshaw’s body but somehow the young City keeper managed to reach back and claw back the ball just before it completely crossed the line. Unlike Bradford City’s on Boxing Day, this wasn’t in but my was it close. With 15 minutes left Ethan Robson replaced Cattermole and just as Gooch had done made an immediate impact. He’d only been on a matter of seconds when he put in a crunching tackle in the middle of the park and almost immediately after that won the ball again and set Kimpioka off down the left and into space. It was a decent chance which Grimshaw did well to block. The final chance came right at the end when Lee Connelly, brought on in the 89th minute almost opened his account with the last kick of the game. It was an enjoyable match and the majority of the 14,679 spectators left happy, hoping for a home draw on Friday. Bury away on a Tuesday night is just about doable but having been to every Checkatrade game so far I don’t fancy a trip to Portsmouth or Bristol. What a rubbish article. First City’s manager has not been Pellegini for two years! Second the fact that City play a semi final tonight and that our manager has included a host of our young plyers in the squad he will pick from meant that you defeated a much weakened side. You included the hatchet man Cattermole to frighten our youngsters. If that was the best you could do, then you are playing in your correct division. Apologies. Of course it is not Pelligrini in charge My mistake. I have corrected that. If you read the article properly you will see that I mentioned both of the other points you make in relation to our performance. We are in League 1 because our performances over the past few years have not been good enough no argument. This season I have found that supporters of our opponents have none of the arrogance that some followers of teams with the financial clout that Middle Eastern wealth brings have. Have you forgotten that not that long ago Citeh were a third division team. In the past I have always found Man City fans decent enough but then we have our moaners and whingers too. Perhaps you could become Brian’s pen pal. I thought it was compulsive viewing, although that may be as much about the way that Netflix facilitates the addict with the ability to binge watch. I’m not sure what Grayson is complaining about in his subsequent comments about not being portrayed particularly well. If I had a criticism is that they didn’t really flesh him out as a character that well. I disliked Bain, he seemed to represent that new gen of football executives who are so concerned with image and speak as if they’ve swallowed management books. I was never a fan of Coleman, but he comes across well in the documentary and the staff at the club clearly adored him. What amazed me was how functional the club looked in training and behind the scenes. You tend to think of clubs being rotten from top to bottom, but that wasn’t the case in this documentary. I’ve said before that the parallels between City and Sunderland always strike me. The story in the documentary was our story 20 years ago – we were envious of you in those days (you were going places, we were going down and down). We had a succession of managers and players who looked like the right fit and turned out to be a disaster. It was only when we went down to the third tier that the club really started to make tough decisions about how the future should look, although I still blame Royle for almost willing us to get relegated so that he could take us back up. The first thing I remember doing when we did go down to the third tier was renewing my season ticket and we got big crowds that year too. It felt like anyone who was at the match was only interested in supporting the team rather than wanting to abuse them. The toxins, if you will, were finally being flushed out of the club. One last thing about the doc. I felt sorry for Rodwell, possibly because he is ex-City. It’s not his fault the club put him on a silly contract. Glad he has finally moved on.